Gone are the days when VR content creation was restricted to expensive equipment. 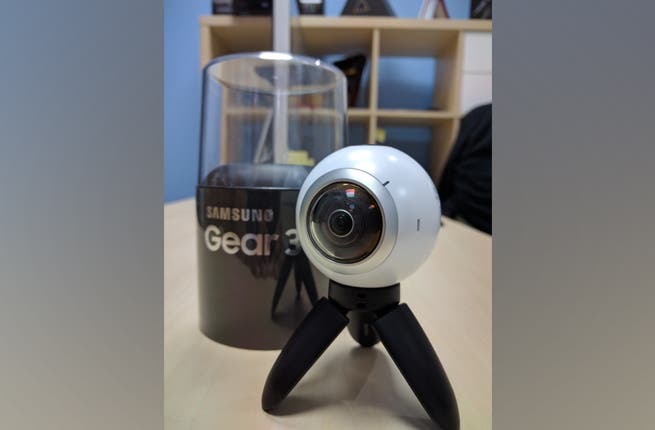 Virtual Reality and 360 videos are within everyone’s reach now and Samsung is making it even easier with the introduction of the Samsung Gear 360 camera. We got our hands on it, and here is what we think. A quick glance at the Samsung Gear 360 and the first image in your head would be a billiards cue ball, round and white, and weighing roughly the same. You have cameras located on two sides designated front and rear. The front lens is adjacent to a tiny LCD display with a record button and two pinhole microphones. On one side we can see the buttons for accessing the menu as well as the power switch, which doubles as a Bluetooth button and a Back button respectively. On the other side, we have the NFC tag and a little compartment which houses the battery pack, micro USB charging port and memory card slot. The camera also comes with a built in miniature tripod screwed in the bottom. I personally liked the mini tripod. When folded, it acts as a great grip to record with, and if you want to do videos where the camera stays stationary, then open up the tripod and set it on a straight surface. Overall, the design of the Gear 360 is pretty neat, except the fact that it's not something that you can carry around everywhere. While other 360 degree cameras opt for a slim design for easy transportation, this round cueball design and the mini tripod won’t fit in your pocket. The Samsung Gear 360 houses two 15MP 1 / 2.3 inch CMOS sensors that are capable of recording a 360 degree video with almost 4K resolutions of 3840 x 1920 at 30 fps. 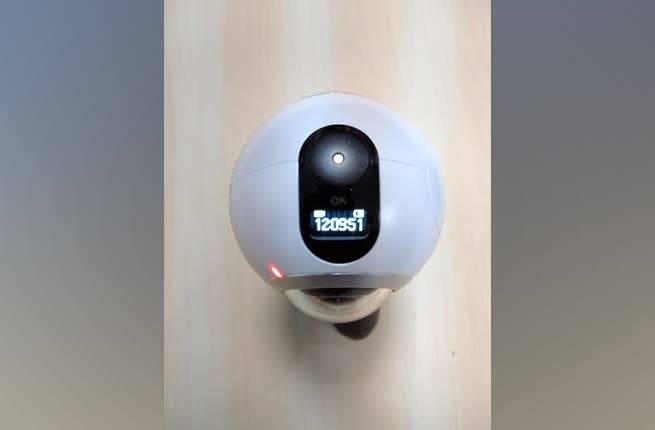 When switched to single camera mode, the Gear 360 can shoot videos at 2560 x 1440 pixels, while still photos can be taken at 30MP in dual mode and 5MP in single mode. It’s not the fastest camera in the market, but given that these are early days for consumer VR, we will let that slide. The Gear 360 is pretty simple to use, and can be operated without the phone app. Once you turn on the camera, you just have to scroll through your options of 360 videos, photos, time lapses or looping videos. However, make sure you have enough memory, as the camera automatically overwrites the memory card when full. 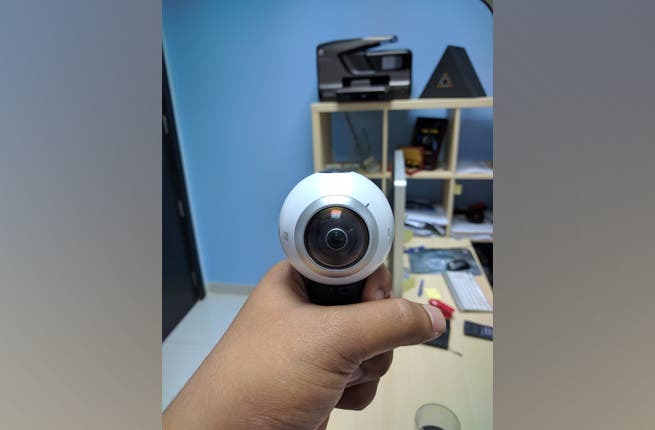 Though you can operate the camera independant of the phone, it works best when used with the Samsung Gear 360 app. The camera easily pairs with a compatible device (we used a Samsung S7) such as Samsung latest flagships Galaxy S7, S7 Edge, Note 7 or even previous models like the S6, S6 Edge or Galaxy Note 5. Pairing process can be done via NFC/Bluetooth, and launching the app. I found it funny that the camera only works with Samsung devices, but since its Android, there are other apps you can download to make it work with other Android devices. The app allows you to remotely control the camera. I found this quite useful, especially when I wanted to record videos by keeping the camera on a higher surface or when I didn't want to be in the frame. The app also provides a live view of what the camera sees in three modes, 360 degree, dual view and panoramic view. Additionally, the best feature of the app is that once you record a video and save it to you phone from the device, it will automatically do all the conversion and stitching magic, thus resulting in a VR ready video on your device. I would highly recommend saving your files first, as sometimes the videos can take a while to load in the memory card. Additionally, you can also download the official app on your desktop called Samsung Director to make editing on your PC much easier. One point to be noted is that the Samsung Gear 360 carries an IP5 rating, making it water and dust resistant. Sure it can take a splash of water, but don’t jump into the pool with it. Shooting with the Samsung Gear 360 can be a lot of fun. We decided to take it to Magic Planet Mall of the Emirates, and you can watch our video here. Generally speaking, the quality of content produced by the Samsung Gear 360 is pretty decent- going by the bar set by action cams. The microphone does an amazing job of picking up audio and colors come out well, but do lack a certain vividness. Provided you have the right lighting, you can get some impressive photos or videos. The images and videos look great on the phone, but they lose quality when blown up to full size on a monitor or TV. However, the disappointment is when the app stitches the images by itself, mainly because of incorrect alignment occasionally. The camera also heats up if used extensively for a while. Similarly, the phone also heats up during the conversion and transfers of the files. Battery life is decent though and you’d almost be able to get a day out of it provided you’re not continuously shooting. If you are planning on extended use, I suggest you pack an extra battery. 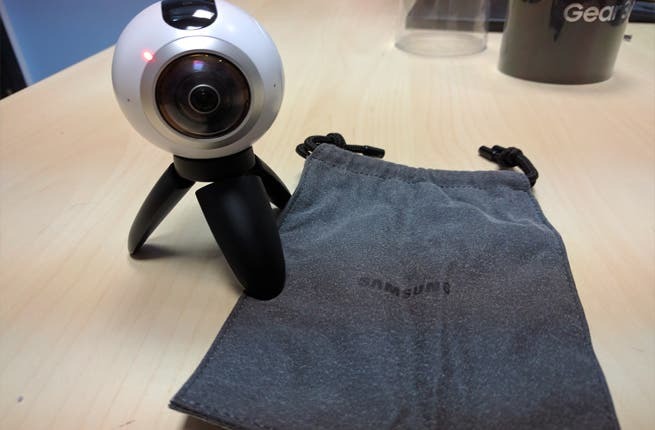 If you are looking for an affordable 360 degree camera to satisfy your VR needs, the Samsung Gear 360 is definitely a good choice. However, the camera is optimized to work within the Samsung Ecosystem, and specifically just a few Samsung devices. Yes, you can use it by itself, but the hardware works best with the app. You can get the Samsung Gear 360 for AED1449 from Samsung showrooms all over the UAE.